takes its name from a song on The Fall’s album Hex Enduction Hour (1982). The past is always present in her accumulations of everyday objects, which capture memories like a butterfly in a net. In this exhibition she presents layered paintings and sculptural bricolages, and like all the best things they appear grotesque but seductive. InWitness (2009) the canvas is collaged with leather then painted with quasi-expressionist spills and smears of thick oils, enamels and wood preserver, scraps of masking tape and surface scratches. It looks like an artist’s studio digested, regurgitated and reassembled into a palimpsest of abstractions, experiments and mistakes. And although the result is gross, it is also glossy and decadently attractive. MICHAELA EICHWALD, Alchemie, 2009. 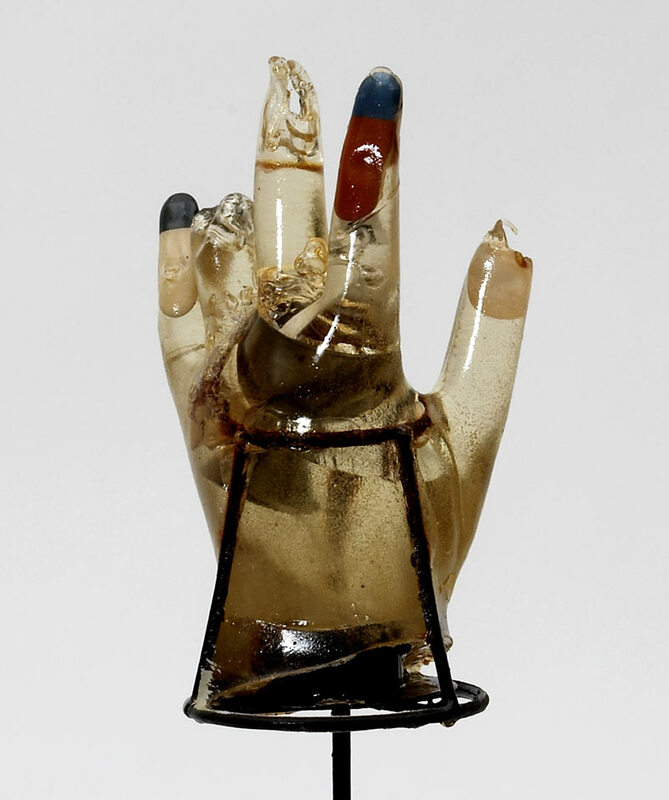 Metal, eraser, gum,plaster, enamel, resin and tin, 53 x 16 x 15 cm. Courtesy Vilma Gold, London. 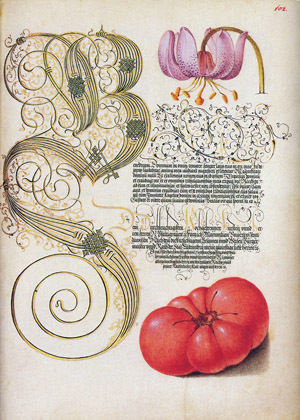 In the 1500s, as printing became the most common method of producing books, intellectuals increasingly valued the inventiveness of scribes and the aesthetic qualities of writing. 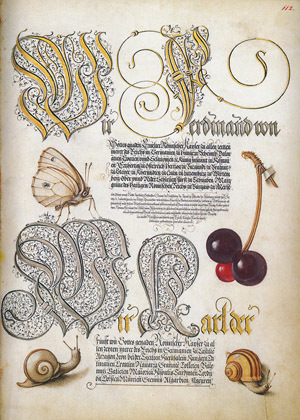 From 1561 to 1562, Georg Bocskay, the Croatian-born court secretary to the Holy Roman Emperor Ferdinand I, created thisModel Book of Calligraphy in Vienna to demonstrate his technical mastery of the immense range of writing styles known to him. 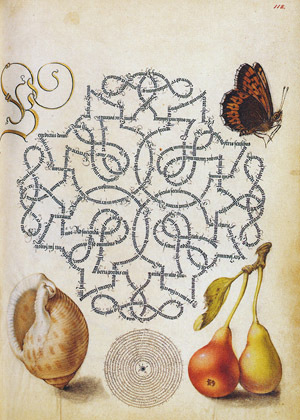 About thirty years later, Emperor Rudolph II, Ferdinand’s grandson, commissioned Joris Hoefnagel to illuminate Bocskay’s model book. 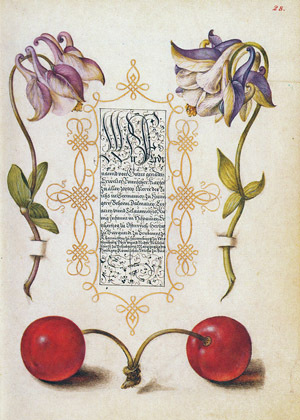 Hoefnagel added fruit, flowers, and insects to nearly every page, composing them so as to enhance the unity and balance of the page’s design. It was one of the most unusual collaborations between scribe and painter in the history of manuscript illumination. Because of Hoefnagel’s interest in painting objects of nature, his detailed images complement Rudolph II’s celebrated Kunstkammer, a cabinet of curiosities that contained bones, shells, fossils, and other natural specimens. Hoefnagel’s careful images of nature also influenced the development of Netherlandish still life painting.